Air is changed continuously even with windows closed for security. An average house of 240 cubic metres will receive up to 10 air changes a day on a sunny day. Cool air is brought in from the Southside, drawn throughout the house as stale air is vented. The hotter the sun, the faster the fan speed, the more ventilation power. Heat from under the roof which normally would be wasted, is drawn down into the basement, if no basement, to the floor where it is distributed. 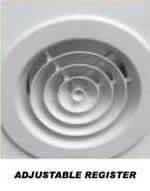 This heat will dry out moisture and rise through the house as the roof fan vents stale air. State of the art, BP solar panel provides 12V of 'safe power' to drive high efficiency German fans. DIY kitset supplied. 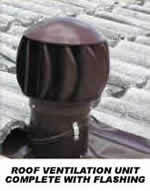 The complete system to ventilate your house. This equipment is supplied only. Please engage an appropriately licensed installer to install the package.